This is a 20 x 5 inch flap. 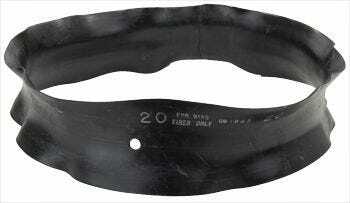 A high quality inner tube liner will significantly increase the service life of your tubes. Tube liners, also known as tube flaps or tube boots, are used to protect tubes from wear, heat, and other irregularities in the rims. Typically used on split rims, two-piece rims or vehicles with wood spoke wheels. These flaps are designed with high quality rubber, made for durability and are available in many sizes. We recommend new tube liners when replacing tires. Speak to a Tire Expert for assistance with your order. What would be the correct size flap for your 7.00-20 truck tires on 4 inch rims? does this liner fit a 600-20 tire and tube? Yes, this is the proper flap for your application!